Appendectomy is a surgical procedure used for the removal of vermiform appendix. This procedure is normally performed in a situation where patient suffer acute appendicitis. Appendicitis is an inflammatory condition of the appendix. 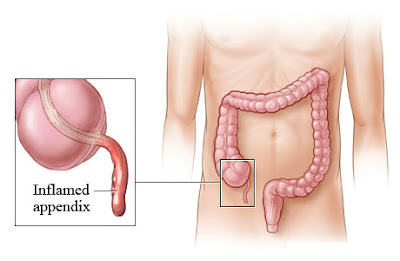 Appendix is a worm shaped pouch that extends out from the cecum. Appendicitis is caused when the appendix is blocked often by foreign body, cancer or by stool. Blockage can also caused from infection. Appendectomy can be performed using two method - Open Surgery or Laparoscopic Surgery. The surgery type is determine based on several factors includes severity of the appendicitis and medical history of patient. In this procedure surgeon makes a small incision in the lower side of the abdomen. Appendix is removed and wound is appended with stitches. This procedure helps the surgeon to clean the abdominal cavity if the appendix is burst. During laparoscopic procedure, appendix is accessed through small incisions in the abdominal. A small narrow tube called cannula is inserted which will inflate abdomen with carbon dioxide gas. The gas allows the surgeon to see the appendix clearly. Once the abdomen is aerated an instrument called laparoscope is inserted which will display the inside portion of your abdomen. The founded appendix can easily be removed. Our doctor, leading Laparoscopic surgeon in Bangalore offers advanced Appendectomy procedure in a cost effective manner. He always try to keep a friendly atmosphere with his patients. Your blog was absolutely fantastic! Great deal of great information and this can be useful some or maybe the other way. Keep updating your blog. Hernia operation are one of the commonest operations &laparoscopic surgery has brought revolution to this disease. Bilateral inguinal hernia , unilateral inguinal hernia, recurrent hernia, large hernia in the inguinal region and femoral region are very well tackled by this approach of keyhole surgery. One of the most important type of hernia are the #incisional hernia & ventral hernias that happens in the abdominal wall which occurs postoperatively. They are conventionally done by open surgery but it poses lot of wound related complications like wound infections, pain, recurrent hernia, flap necroses, blacking of the skin & bad scar. All these complications can be avoided if one does laparoscopic repair .Normally the IPOM & IPOM PLUS are the the two approaches which are used for incisional hernias . Meshes used in IPOM & IPOM PLUS are very expensive and can be done away with modern way treatment of abdominal wall reconstruction know as AWR. Different approaches are Tep ie extra peritoneal approach and eTAP ie extended totally extraperitoneal approach and TAPP . These are all abbreviations of different types of hernias. Presently in very large hernias TAR is the operation in fashion. Bigger operations resulting in big incisional hernias require defect closure rather then bridging the defect by this type of an operation known as transverse abdomonis release (TAR). One can use a very large mesh 30×30 cm to reinforce abdominal wall which has been destroyed by incisional hernias. Patients functional results are superlative. These procedures can be done laparoscopically and has come as a huge advancement &revolution in hernia surgeries .